1967 Pedro Rodriguez Protos F2 Enna Crash - Steering Wheel. 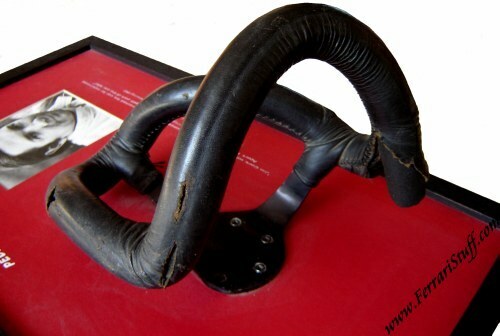 Here we have a VERY special and TOTALLY unique item albeit not of Ferrari origin but since Pedro Rodriguez was such a prominent Ferrari personality, we felt it was appropriate to feature this item here. 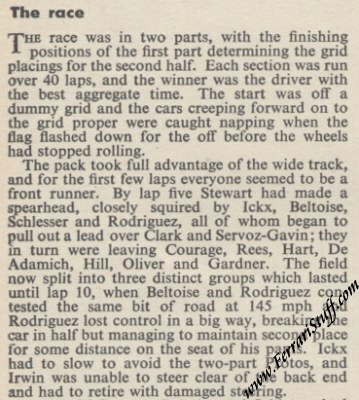 In the 1967 season, it was quite normal for hot-shot Formula 1 drivers to also compete in the Formula 2 championship and so did Pedro Rodriguez eventhough he was a Cooper works F1 driver at that time. On August the 20th, 1967 Pedro drove the Ron Harris entered Protos Cosworth F2 in the "Gran Premio del Mediterraneo" at the Enna track on Sicily. The Protos F2 was quite a special car which was designed by Frank Costin with a chassis that was largely made of wood and which featured an enclosed cockpit! During the race, Pedro was battling it out with Jean-Pierre Beltoise for second place, lost it and crashed the car heavily, thus smashing it to matchwood! 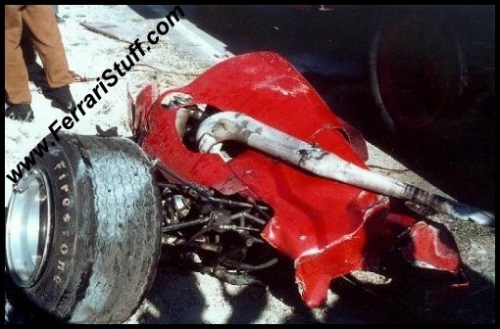 According to the person that salvaged this steering wheel from the wreck, it was, apart from the engine(! ), the largest surviving part of the car! 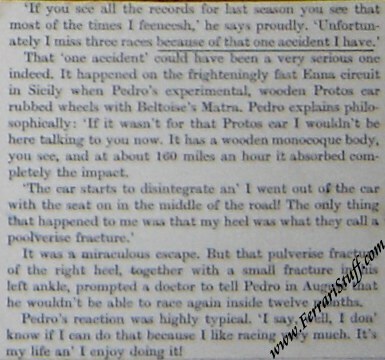 Amazingly enough, Pedro only suffered a broken heel in this massive crash. 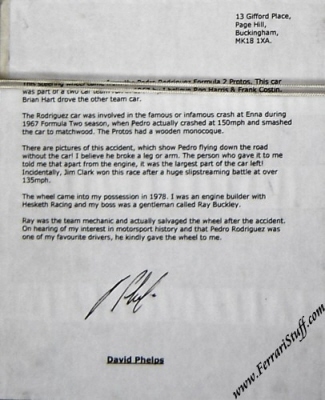 Ray Buckley, who was the team mechanic at the Ron Harris racing team salvaged the steering wheel and later, when he was employed by the Hesketh F1 team, passed it on to David Phelbs who had it mounted as presented and offered for sale now. 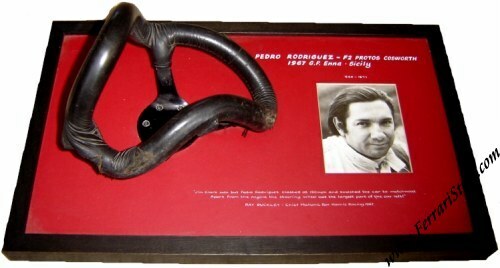 The front of this mounting shows of course this very original steering wheel, a photo of Pedro and a caption. 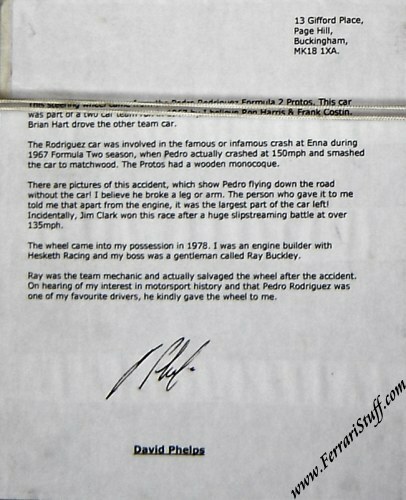 The rear shows the declaration of David Phelbs and how he got to this steering wheel + a copy of an interview with Pedro on this shunt. 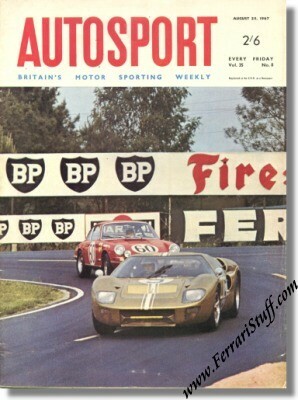 Along with it comes an original copy "Autosport" with a write up on the race and the accident. 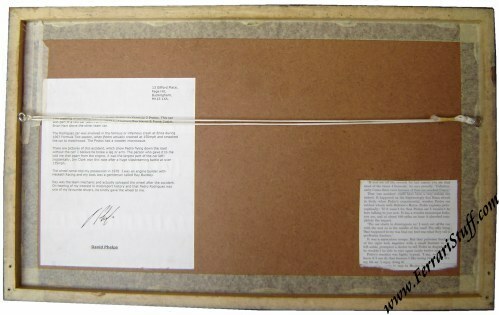 Truly a once-in-a-lifetime opportunity to acquire such a unique item in such unmolested condition (after all, this is how it came out of the crash!) with such excellent provenance.